On January 10, 2018, Governor Jerry Brown issued his proposed budget for California's 2018/2019 fiscal year. The proposed budget detail is available here. The Governor is proposing a modest increase (about 3%) in the total number of program position from the current year. Compared to the prior 2015/2016 fiscal year, however, the increase is more significant - about 25% (from 468.8 to 584 positions). 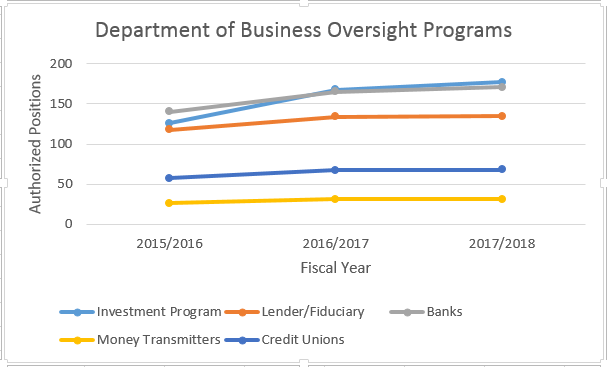 Despite significant federal preemption of state securities laws, the biggest increase has been in the Department's investment program which regulates the offer and sale of certain securities, franchises, and licenses and examines broker-dealers and investment advisers.